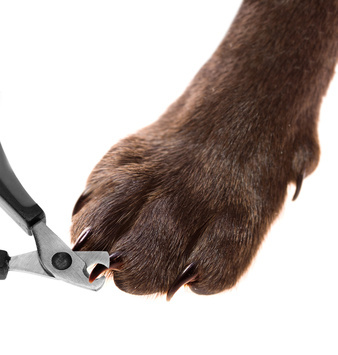 Regular nail clip ping, or trimming, should be part of the routine care of your pet. It is essential for elderly and indoor pets, whereas outdoor pets may wear their nails down naturally. The requirement for nail trimming can vary depending on breed, age, level of exercise and the environment in which your pet is kept. Working and herding breeds of dogs are active and generally have compact feet with well arched toes that angle the toenails downwards towards the ground. If these dogs are active on hard surfaces such as gravel, rock and concrete, their nails may not need trimming until they slow down with age and exercise less, however you will still need to attend to their dew claws (the little claws on the inside of their front legs that don’t touch the ground) regularly. Other breeds may have nails that grow more forward than downward, and therefore no matter how much exercise they get on rough ground, it is unlikely they will wear down naturally. Some dogs may benefit from having the tips of their nails taken off once every week or two, however for most it will be longer than this, and you will have to decide what is right for your dog by inspecting its nails on a regular basis. Certainly if you notice a change in the sound of your dog's nails on hard floors this is a pretty good indication that it is time for a trim. Cats can also require nail clipping, with the frequency depending on their lifestyle. Indoor-only cats will need more regular nail trims whereas outdoor cats may naturally wear their nails and require less frequent or no trimming. We have a variety of nail clippers that suit different pets - from the very small to the very tall. Make a complimentary appointment today to have your pet’s nails checked. We can also teach you how to do it if you would prefer to cut them yourself.